Saturday, May 4, 2019 from 11:00am to 3:00pm. E. Mountain View St. between Barstow Rd. and Second Ave.
Police Officers, Fire Fighters, and other emergency personnel will be present for the public to interact with. 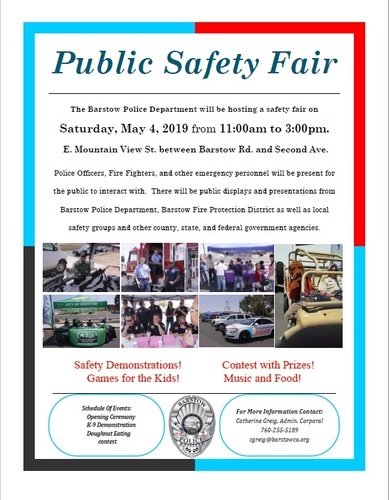 There will be public displays and presentations from Barstow Police Department, Barstow Fire Protection District as well as local safety groups and other county, state, and federal government agencies.